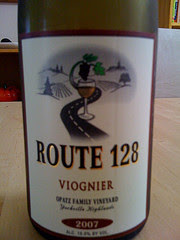 A sleek Rhone-style bottle tinted brownish-green bears a label showing a color drawing of a winding, two-lane blacktop road. The road cuts through vineyards, much like the actual Route 128 which connects Sonoma and Napa Counties at the northern reach for both. The ABV for this wine is a staggering 15%, much higher than I expected it would be. 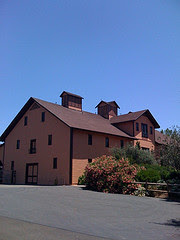 The Opatz Family Vineyards Yorkville Highlands, between the Alexander and Anderson Valleys, is the source for the grapes. The Nose: The aromas are hard to figure. Pear and an unusual sort of floral scent are in there. The floral is not overwhelming, though. Abundant minerals are also present. The Taste: This wine's acidity is pretty high as you would expect at 15%. The alcohol does not dominate, though. The pears are joined by a white pepper spiciness that hits the right notes. This should be a really wonderful food wine. 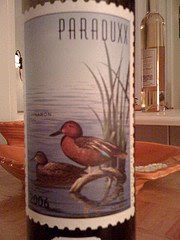 A beautiful rendering of two cinnamon teal ducks graces the label, a work of South Dakota artist Mark Anderson. The picture is made to look like a postage stamp, or a duck stamp as it were. It is the thirteenth in this series. The blend is 64% Zinfandel, 27% Cabernet Sauvignon, 7% Merlot and 2% Cabernet Franc. Paraduxx aims to make a "bold and expressive Napa Valley red wine." The abv is 14.5%. This has a price tag of $47 on it, although I do believe I got it on sale. There is a good deal of heat on the nose of this wine, along with some very concentrated blackberry, tobacco and tar. The aromas really come through in a big way. It's very bold, and colored quite darkly, too. The very deep purple hardly allows any light through at all. As with the nose, the wine carries quite an alcohol statement. It settles down nicely, but you really need to let this sit for an hour or so before enjoying. And enjoy I did. The blackberries are lush and there is a trace of leather in it, but not as strong a streak as I expected to find. Fairly strong tannins give this wine a very sturdy backbone. You could pair this with just about any kind of red meat without worrying that it will stand up. It will. The Bottle: An unusual shape gives this clear specialty bottle a distinctive look. And a distinctive wine it is - as I will cover in a moment. Preston is an organic family farm in the Dry Creek Valley appellation of Sonoma County. Grapes are just one crop they produce. The wine they make from it, I must admit, does not strike me as "right up my alley," based on my sampling in their tasting room. This wine, however, made an impression on me. It's a white Rhone blend, I believe of Marsanne, Roussanne and Viognier. The abv is 14.2%. It seems to be a non-vintage. The Nose: There's a very fragrant nose, with flowers and a sweet honey component. I pick up traces of wet rocks, too. The Taste: The fruit is quite subdued, very French tasting in the mouth. There's a good bit of minerality and a sort of nutty flavor that lurks in the finish. A bit of oak gives the wine a lot of character. 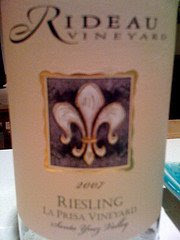 The structure is quite nice, with a good backbone that will make this wine a friend to food. I will try it with pasta. I would guess mushrooms would go well. I had it with Hook's 12-year cheddar and it was sublime. The Bottle: The art of a bare-shouldered vixen spray-painting a heart on a brick wall adorns the front label. So it's not Monet. It is eye-catching. And the lettering - which appears to have been spray-painted on the brick wall earlier - proclaims that "Sonoma County Red Wine Rocks!" On the back, we learn that this wine pays "no attention to vintage or variety." I'll be honest. If I had only the label to go by, I would have gone by without as much as a second glance. But I tasted it before seeing the bottle, at Locals Tasting Room in Geyserville. I liked it and bought it sight unseen. It's produced by RH Wines of Windsor, CA. The Nose: Blackberry, toast and vanilla are what strike me. There's also quite a bit of alcohol on the nose early on, something I did not notice in the tasting room . The aromas are rather strong and quite enjoyable. The Taste: There's a very strong taste of alcohol at first on the palate, too. It's a good idea to let this young wine breathe - a lot. I let it sit in the glass for a half hour and it was still hot. After an hour, it started to settle down nicely. Once it's behaving, there's a nice spicy taste, like clove, amid all that blackberry and licorice. It's a big, bold red, very lively and full in the mouth. 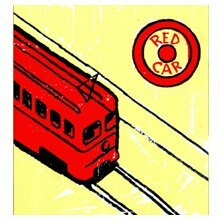 It's been about ten days since I went to the tasting of Red Car Wines at the Wine House in West Los Angeles. I suppose I've been a little bit busy, but I want to post my thoughts on these very nice wines before the memory becomes any more distant. Trolley Pinot Noir 2007 - Deep purple with a lavender nose; black pepper and leather come through very nicely. Good acidity and a full mouthfeel. The Aphorist Pinot Noir 2007 - A fruitier nose than the first wine; very mellow taste full of berries and earth. Sonoma Coast grapes. Heaven & Earth Pinot Noir 2007 - Sonoma Coast fruit again. The nose seemed very obscured to me. The palate featured soft leather and violets. Tomorrowland Syrah 2007 - Sourced from Sonoma County, this one had a pleasantly odd nose; really earthy and musky flavors and aromas. The Fight Syrah 2006 - Central Coast grapes; inky color and a blasting fruit sensation on the nose. The flavors are dark and a bit acidic, but it works very well. Coffee and leather, dark flavors. The Sonoma County town of Geyserville has more good wine being produced in and near it than most folks would think possible. There are so many wineries in the Alexander Valley that it works out to about one winery for every ten people who live in Geyserville. Visiting a winery's tasting room is great, if the winery has one. 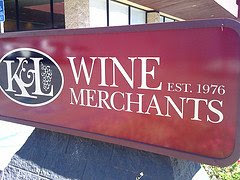 Many of the wine producers in the Geyserville area are such small boutiques that they don't have tasting rooms. That's where Locals comes in. 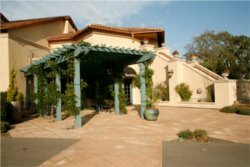 Locals Tasting Room represents a collective of eleven Geyserville area wineries, and offers tastes of 75 different wines produced by them. Most of the wines on the tasting menu are sourced from Alexander Valley grapes. The room is nice and large, with plenty of elbow room at the tasting bar. The staff is quite friendly and they know their stuff, too. 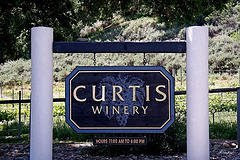 Any questions I had about the wines or the wineries were answered right away. Choosing a reasonable number of wines to taste is the hard part. To guide you in the right direction, Locals likes to pour varietal flights. When you line up six or seven Zinfandels, or a handful of Chardonnays, you can get a good idea of how each wine differs from the others. Or just jump around the menu and find specific wines that appeal to you. That's what I did. With so many reds on the menu, I went with seven of the most likely looking candidates for my taste. Atrea Old Soul Red 2005 - A Rhone-style blend of 46% Zinfandel, 34% Syrah, 11% Petite Sirah and 9% Malbec, this rocks. A complex wine, there's plenty of juicy fruit but there's also pepper, and some sort of sweet notes that peek from around the corner. Eris Ross Carignane 2006 - An old vine red from Lodi, this was medium-bodied and quite smooth. Ramazotti Raffinto 2005 - A Super Tuscan style of 60% Sangiovese, 16% Cabernet Sauvignon, 12% Merlot, 7% Syrah and 5% Cabernet Franc - whew! - which shows lavender on the nose and plum on the palate. They say it has won a number of awards. 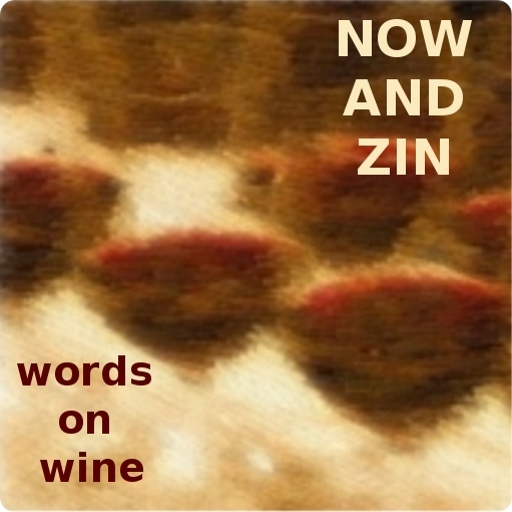 Laurel Glen ZaZin 2007 - Old Vine Lodi with currant and blackberry on the nose, currant and plums on the taste buds. Dark Horse Treborce 2007 - This Zinfandel had an odd nose, with nice texture and flavors of plums and leather, a very earthy taste. Peterson Sangiovese 2006 - This Dry Creek Valley entry is 100% Sangiovese. I found the nose and taste to be a bit lightweight, but it's pleasant nonetheless. Should make for a nice pasta wine. 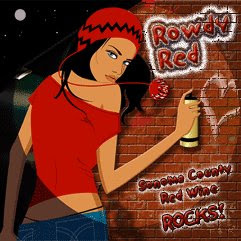 RH Wines Rowdy Red - This is a non-vintge blend that's got a really nice toasty vanilla nose and spicy notes on the palate. It's from Windsor, a little south of Geyservlle. A lively red that will pair well with a lot. See Uncorked with Randy Fuller at 661 Magazine. We were out for a Sunday morning adventure. Well, actually it was a trip to the Studio City Farmers' Market. We don't like difficult adventures. The trip did turn out to be more than we bargained for, though. We strolled through the fruit stands - unfortunately, most of the fruit wasn't quite sweet and delicious just yet - and saw the various bead salespeople, the countless baby strollers and the gourmet corn tamale stand I can smell and identify without looking. There were a couple of guys singing folk music and another guy playing a steel drum, probably the happiest sounding instrument in all the musical world. Nobody's playing the blues on a steel drum. Just about to call it a morning, we remembered the Artisan Cheese Gallery, just steps away from the Farmers' Market. It was an adventure after all. We went for the cheese and stayed for the flight of wines. The aroma of their cheeses is magnificent. It's not overpowering, because all their cheese is put away and refrigerated overnight. It is a very pleasant aroma for a cheese lover to encounter. Here's a rule of thumb: if there's cheese, there's wine. 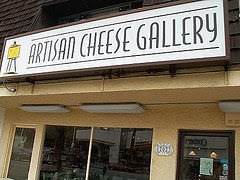 Artisan Cheese Gallery is no exception. Two walls are covered with racks of wine for sale and there are several displays in the floor space. A chalkboard on the counter shows which three wines are on the $8 flight. The flight is served in 3 stemless glasses on a wooden tray. The glasses have a dark spot on them in which the names of the wines are written, but it's no substitute for getting up and examining the labels yourself. A printed sheet containing information on the wine should be provided with your flight. I hope they'll do that in the future. Peirano Estate Vineyard "The Other" 2007 - This blend of 60% Cabernet Sauvignon, 30% Merlot and 10% Syrah has plenty of the earthy characteristics Lodi wine usually brings. This is the most distictive nose of the three, and it has a currant and plum flavor profile. Very nice indeed. Chateau Poitevin 2005 - Described by a staff member as a Bordeaux blend of 55% Merlot, 40% Cabernet Sauvignon and 5% Petit Verdot, this Medoc offering was quite dark in the nose and on the palate. The complexity was not surprising. I am always struck by the complex subtlety in wines from Bordeaux and the surrounding areas. Planeta La Segreta 2007 - This is an interesting blend of the wonderful Italian varietal Nero d'Avola with Merlot, Syrah and Cabernet Franc. The nose was rather difficult for me to ferret out, but plums, raspberries and chocolate were detected by my wife. There may be a bit of coffee in there, too. It tasted like a Sicilian version of Pinot Noir, with plenty of spicy, dark notes. On the way from Napa Valley to Geyserville via Highway 128, there's a driveway I'm glad I drove. That was the one which led to Calistoga's Bennett Lane Winery. A pretty arbor in front of a smallish building provides a fitting entry into the tasting room. Small inside, too, there isn't a lot of room available at the tasting bar. Find a way to elbow in, though. Some very good wine awaits you. White Maximus 2007 - A floral nose - honeysuckle - is enhanced with citrus aromas. The palate is clean and crisp. Good minerals, good acidity. Reserve Chardonnay 2007 - This was billed as a new release, but I think the tasting sheet was printed late last year. The blurb promises Fuji apple, baked pear and toasted hazelnut, but it was all tropical to my nose. A little unexpected, but quite pleasant. This is a full-figure Chardonnay, heavily oaked with the buttery, creamy notes you would expect. Maximus 2005 - Plenty of oak in this big red. I get lots of cedar, vanilla and spices both in the nose and on the tongue. 64% Cabernet Sauvignon, 25% Merlot and 11% Syrah, the fruit is lush and lasts a good long while. It was my favorite. Cabernet Sauvignon 2005 - This 100% Cabernet is a blend of Bennett Lane's estate Cab and that sourced from other Napa Valley growers. A big cherry nose greets you and the taste is driven by flavors of dark plums and leather. Cabernet Sauvignon 2006 - The Cab is augmented by 4% Petit Verdot. It's a very rich wine that, to me, is chocolatey enough to be dessert. But no, they have that covered even better. 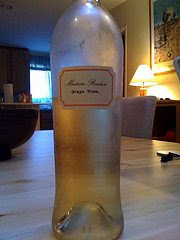 Dessert Wine - This beauty is a non-vintage port-style wine of which less than a hundred cases were produced. I don't know the percentages, but it's made with Cabernet Sauvignon, Petite Sirah and Carignane. Beautiful, rich flavors abound. Figs, cherries and some spicy notes put me in mind of Christmas, even though I had been off the hot, dusty trail for only a few minutes. 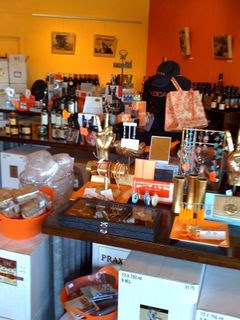 On my recent trip to Northern California, my first winery stop heading northward on Highway 29 was Trefethen in Napa. I must admit that I had never tried any of their wines, so I was starting at square one. They only charge $10 for an Estate Tasting, and $25 for a Winemaker's Reserve Tasting. The former features four wines while the latter offers five. There is no logo glass, by the way, so you won't be adding to your collection. Barn-like on the outside, the interior was that of a warm and comfortable ranch house. Once inside, the people were quite friendly and ready to help. I opted for the Estate Tasting. As sometimes happens, I ended up getting an extra pour from the Winemaker's Reserve list. Viognier 2007 - This one was flowery and perfumed on the nose. The palate featured apple flavors and a lemony tartness that served as a nice counterpoint. The finish was rather lengthy. Cabernet Franc 2006 - An initial sniff on this one gave me a nose full of currants. The palate was like chocolates and cherries, but what really struck me in the taste was the spiciness, like white pepper. Very smooth tannins. Double T Red Wine 2006 - This is a blend of the main grapes from Bordeaux: Cabernet Sauvignon, Merlot, Cabernet Franc, Petit Verdot and Malbec. Expecting a rich and fruitful nose, I was somewhat disappointed to find there wasn't much there. The taste, however, was very much full and satisfying. I didn't expect a vegetal front line, but the flavor seemed dominated by basil. A very odd taste all the way around, but quite enjoyable. Cabernet Sauvignon 2005 - Deep red in color, this cab puts out quite a nose. Rich and fruity, there's even a hint of tobacco, sort of a "Swisher Sweets" aroma. The taste could qualify as dessert in my world, full of chocolate and cherry, with a finish that lingered forever. Pinot Noir 2007 - Another guest was sampling this one, and I was offered a taste, too. Spices on the nose come through first, clove the strongest, and the fruit I pick up is a medley of red berries and cherries. It's a very spicy palate as well, and a lucsious drink to boot.